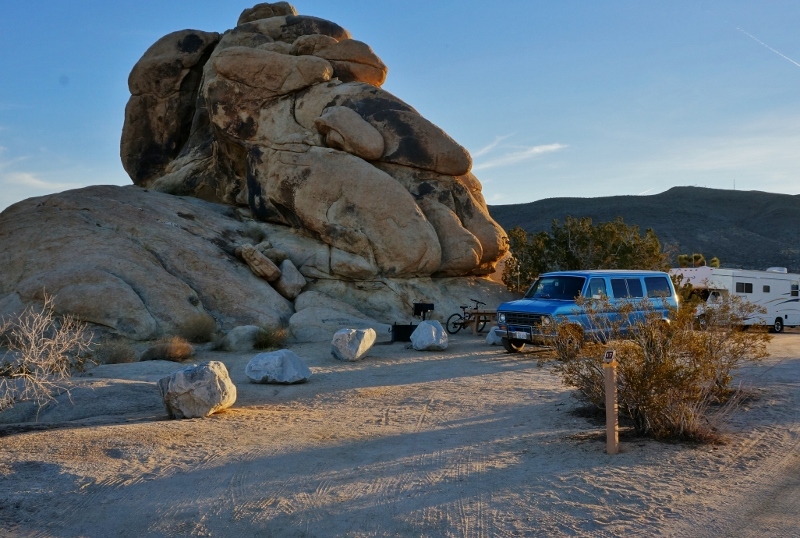 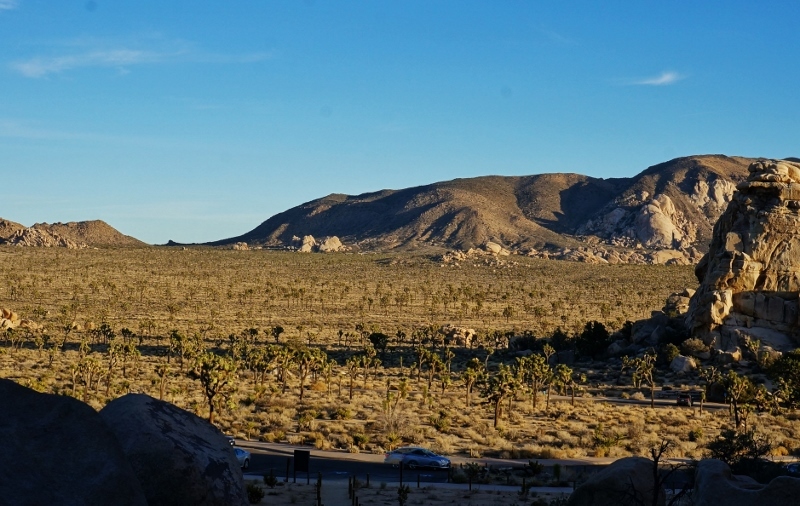 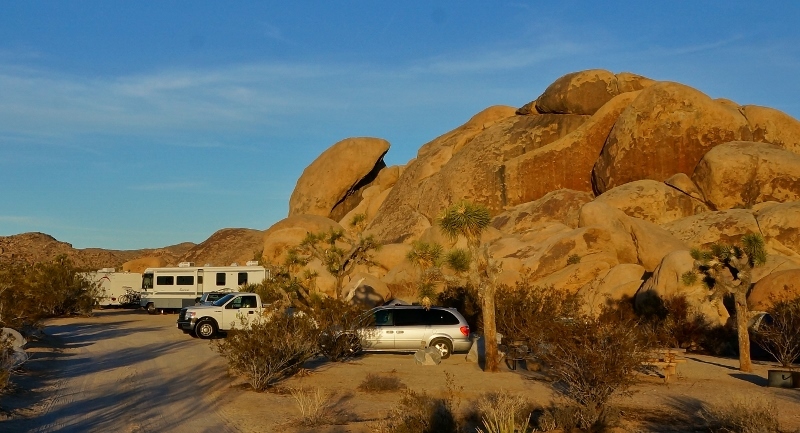 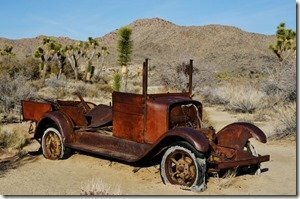 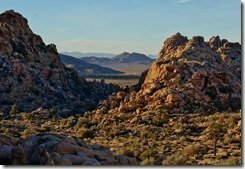 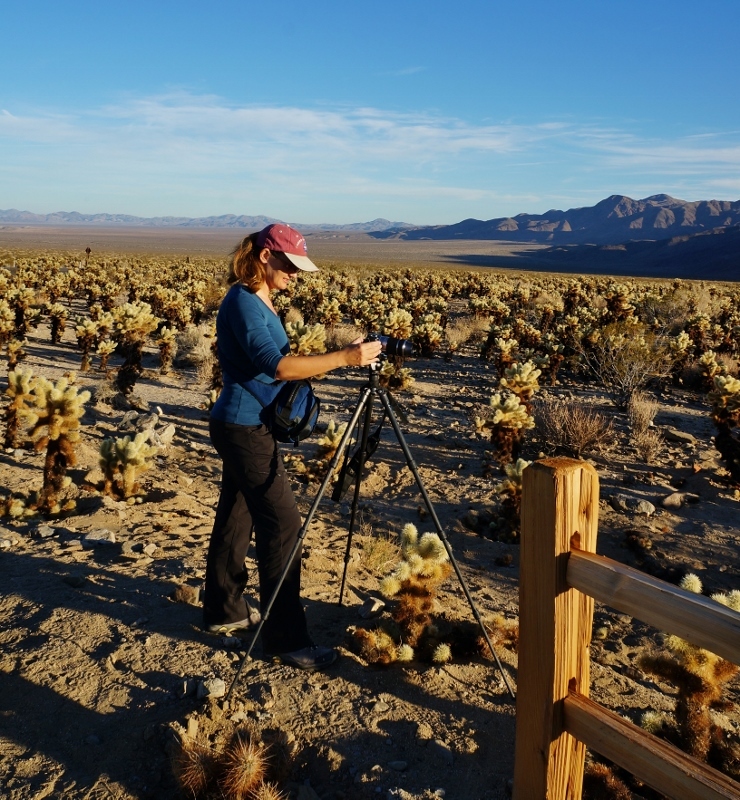 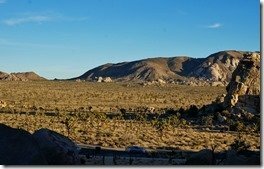 During this visit to Joshua Tree National Park we were blessed with near perfect weather, sunny and mild with daytime temps into the 70s. 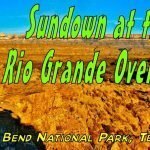 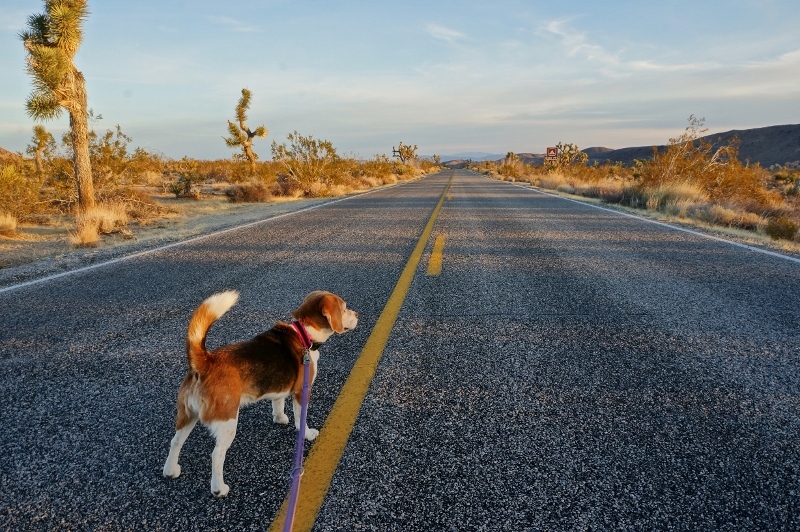 Weather like this is perfect for us because it’s cool enough that we can leave our beagle in the RV with the windows open and she will be quite comfortable while we enjoy some of the hiking opportunities the park offers. 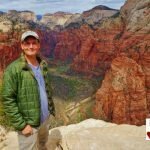 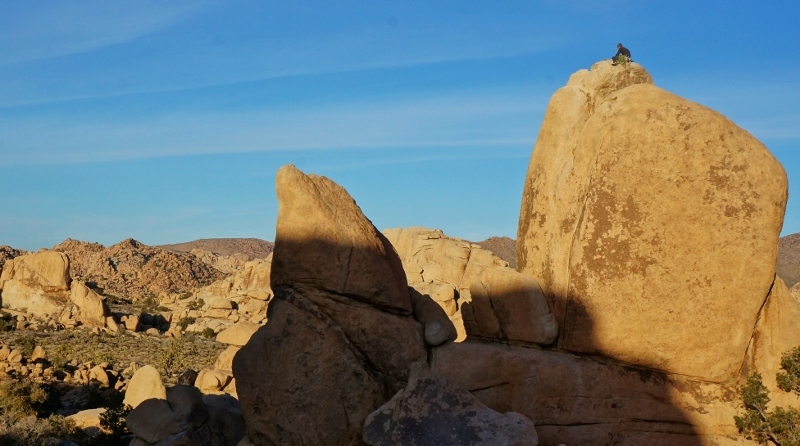 We picked out a couple very scenic and interesting hikes to explore. 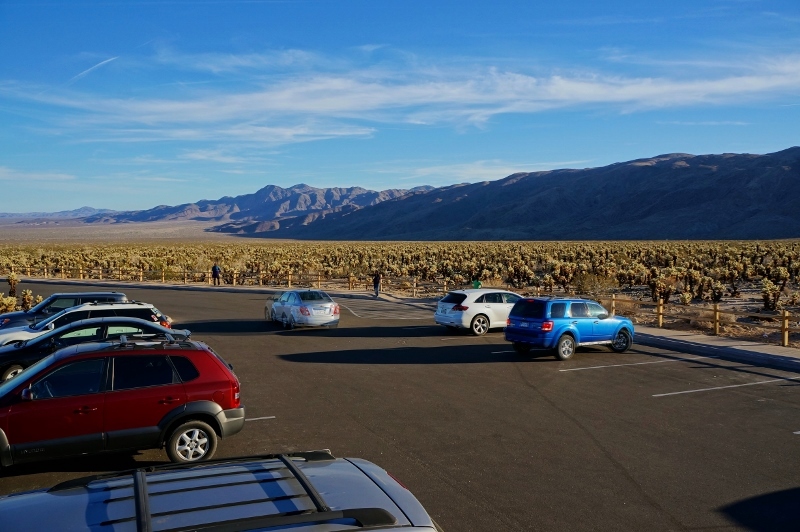 These are two areas of the park we didn’t get to see last visit. 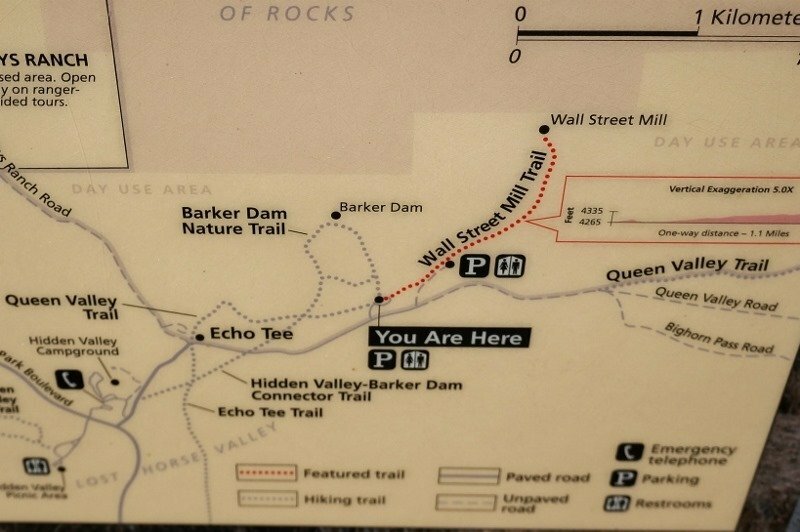 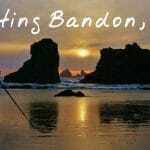 They are very accessible and easy hikes, mostly flat ground and well-marked. 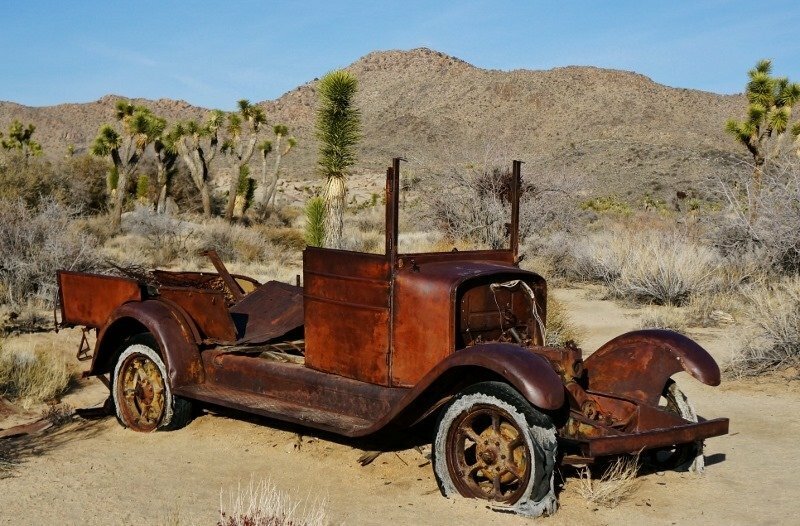 Don’t forget to bring plenty of water though, this is the high desert and very dry. 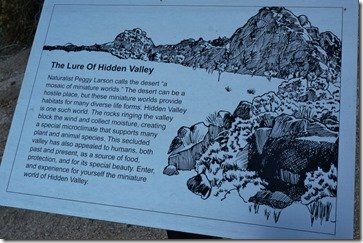 First of the two is called Hidden Valley. 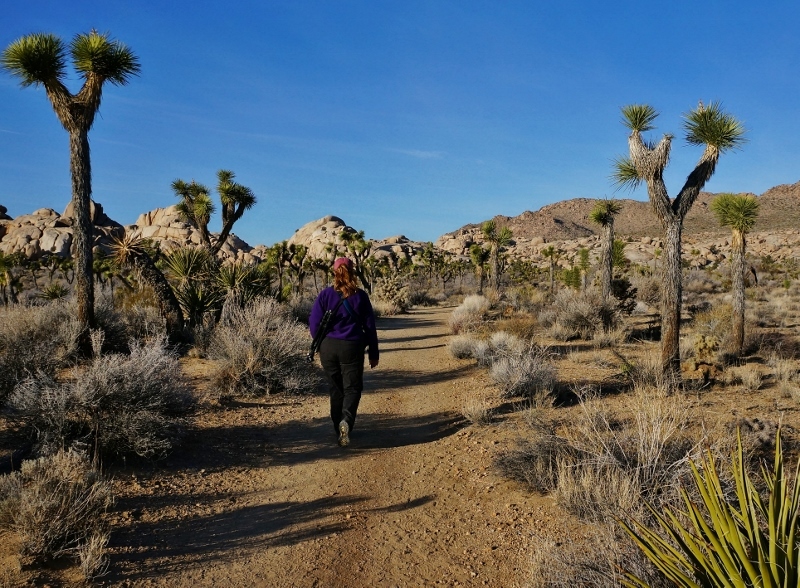 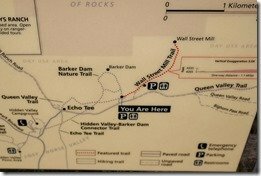 The Hidden Valley Trail is about a mile long loop trail with some minor elevation changes. 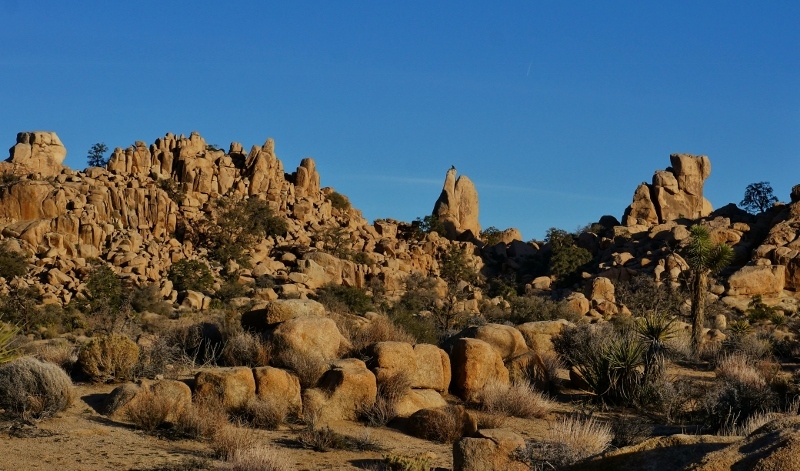 The Hidden Valley gets its name from the fact that it is circled by rocks and boulders all around. 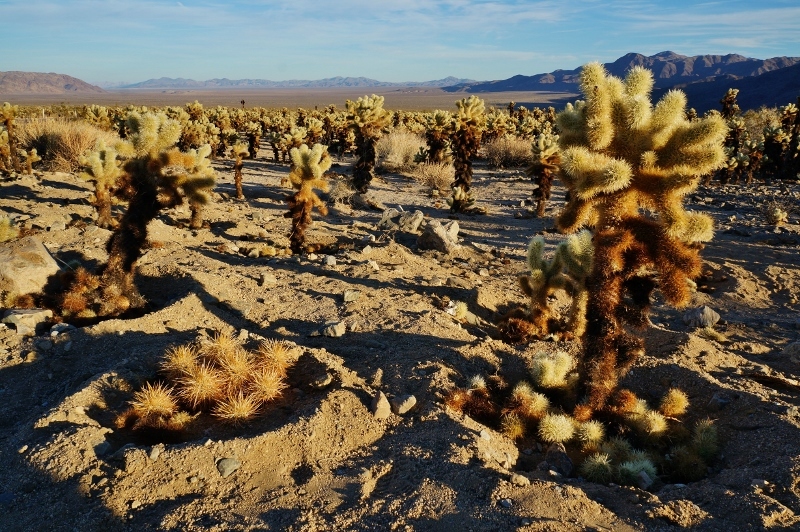 Because of this the valley gets more shade and water is trapped causing a unique micro-climate here allowing for a great diversity of plants and animals. 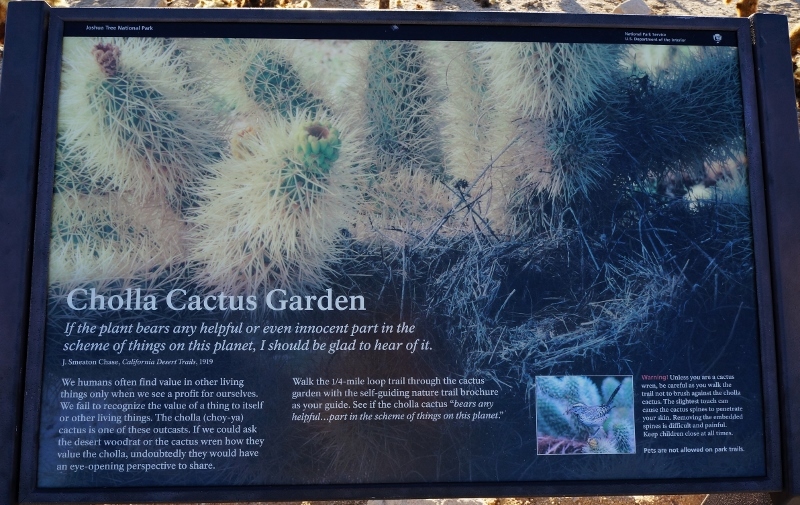 Along the trail there are many interesting signs describing the biodiversity of the area. 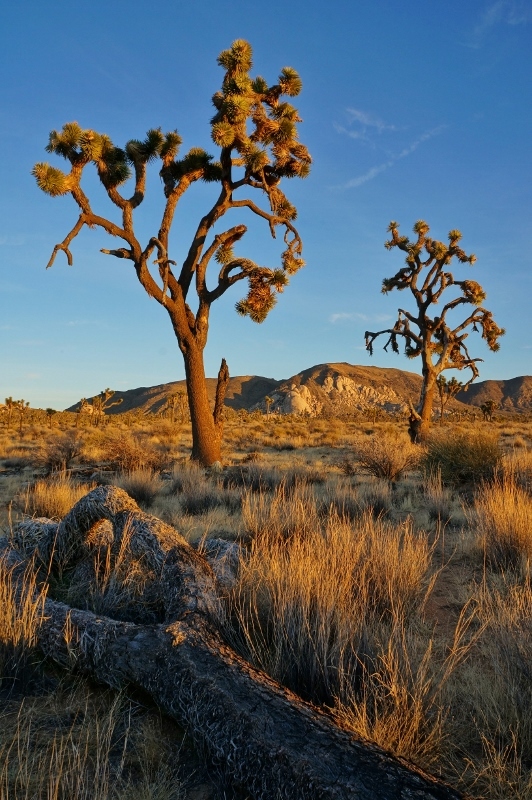 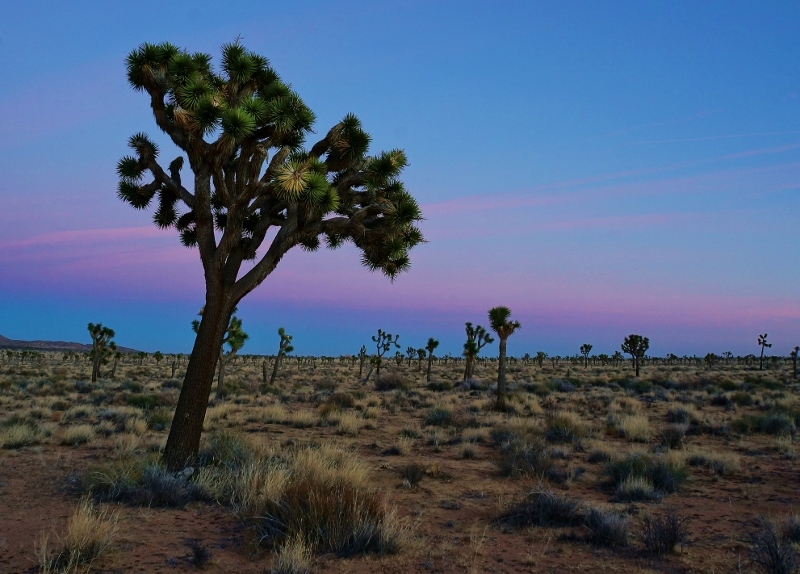 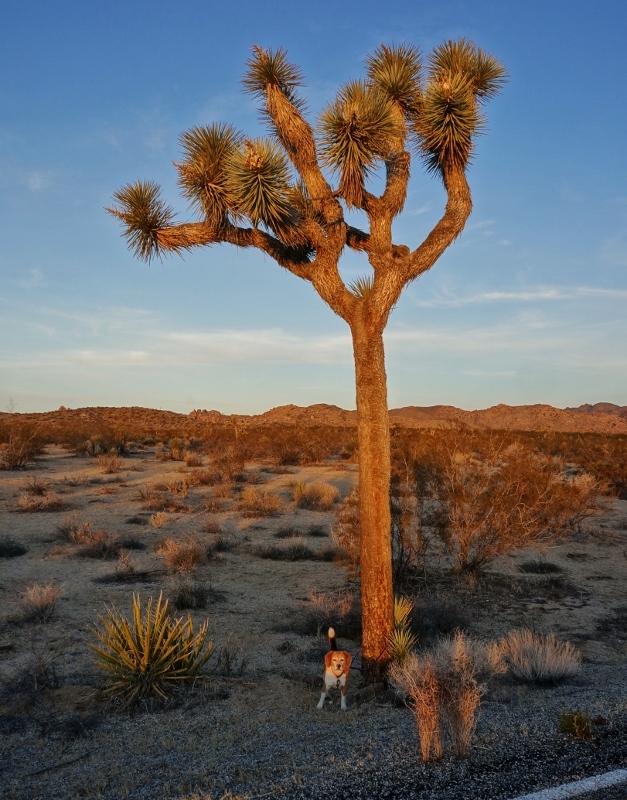 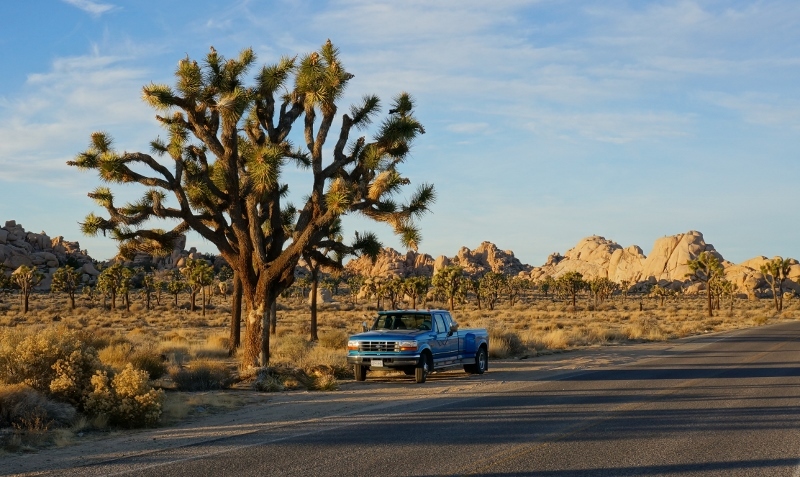 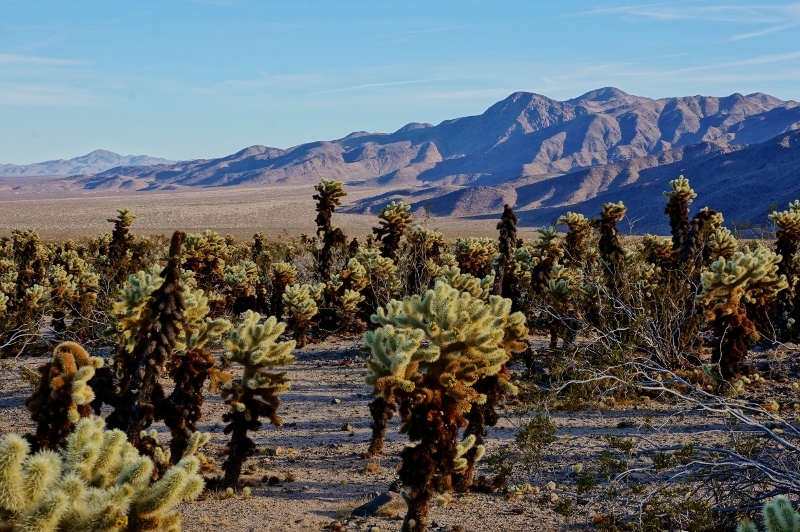 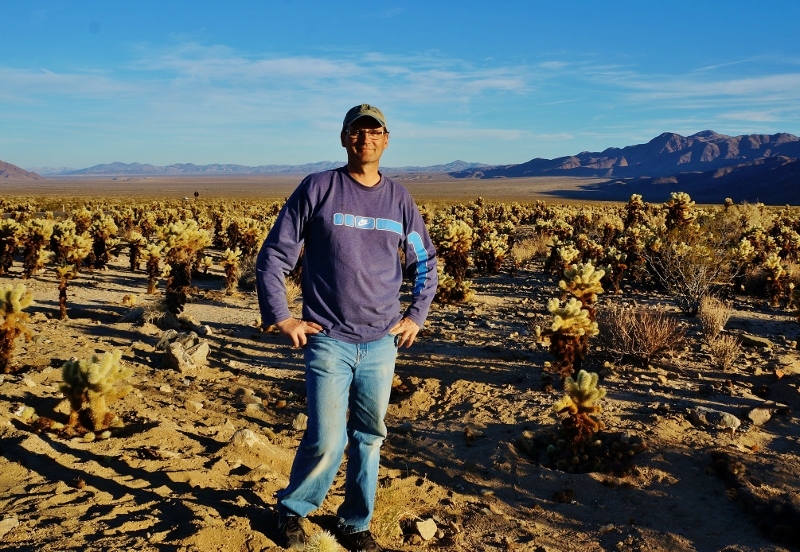 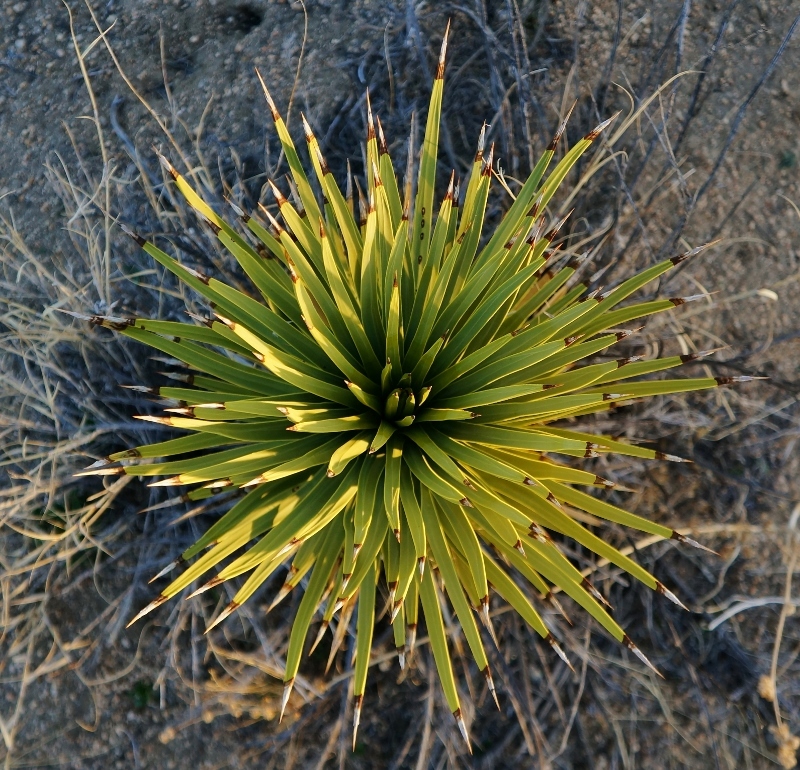 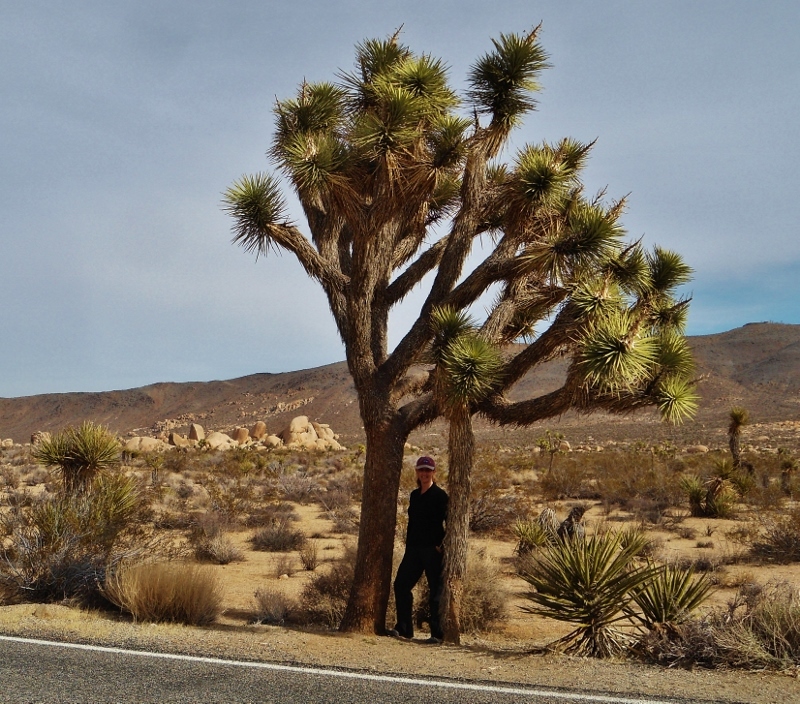 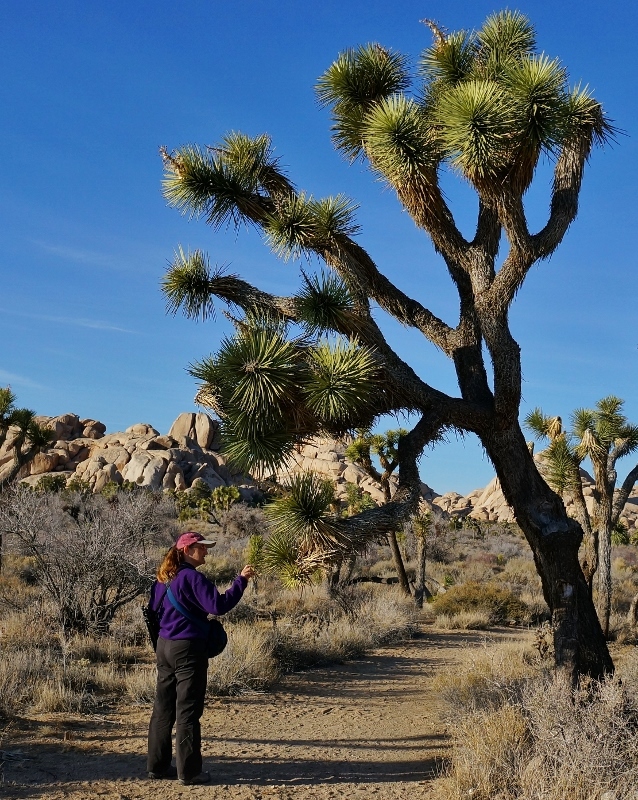 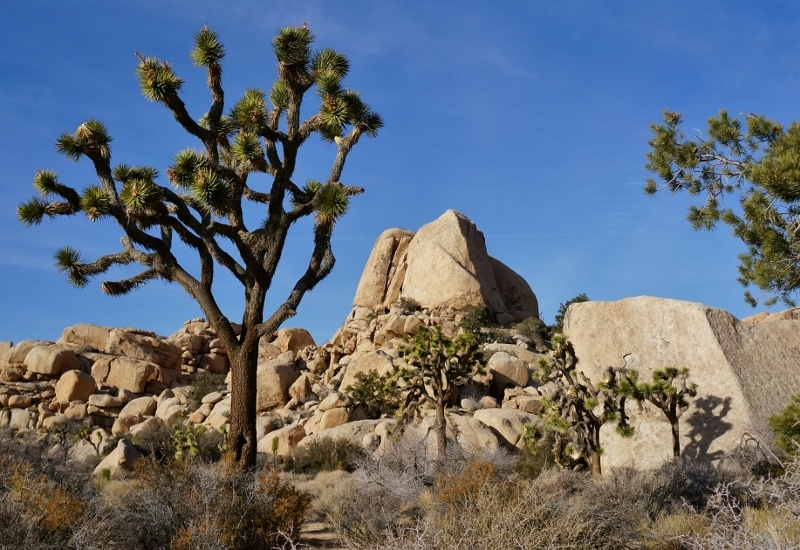 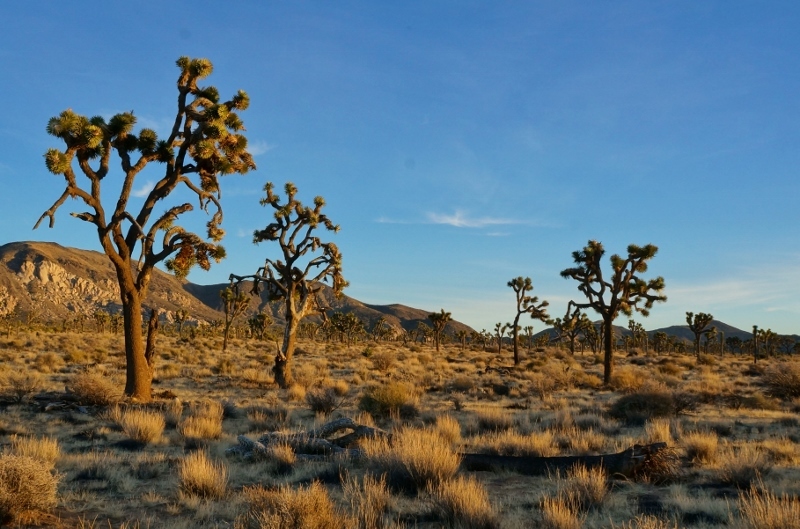 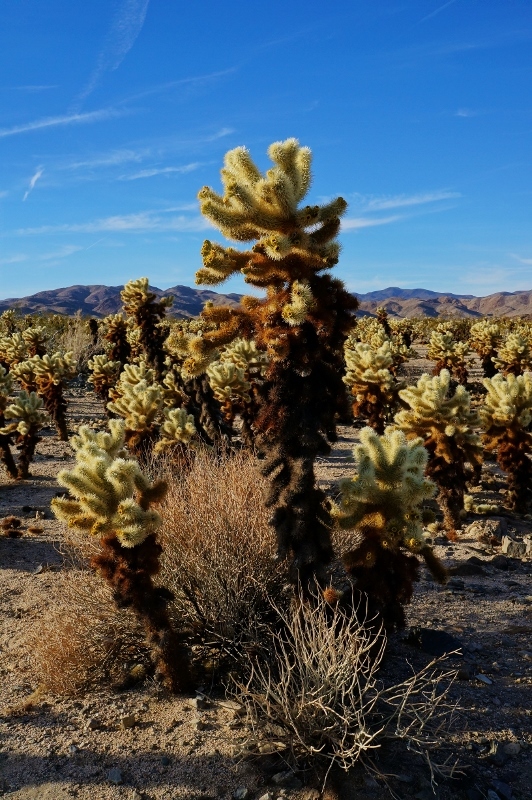 It’s really a beautiful landscape with not only Joshua Trees and cactus but also regular type trees like Oaks and Pine. 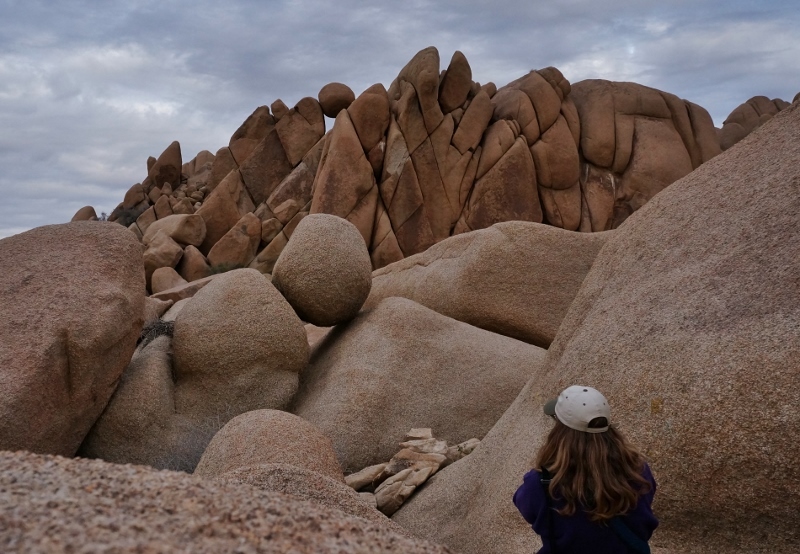 All around you is giant stacks of rocks and huge granite boulders. 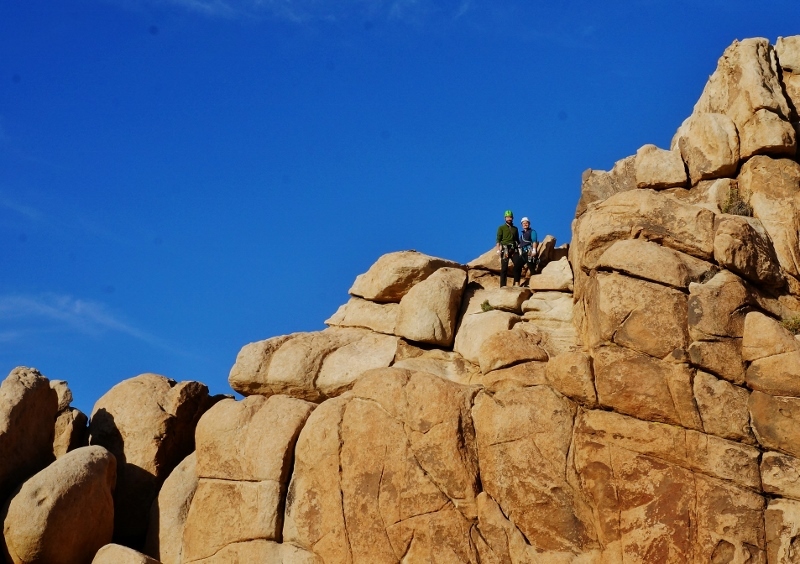 As we made our way around the loop we noticed many folks out climbing the rocks. 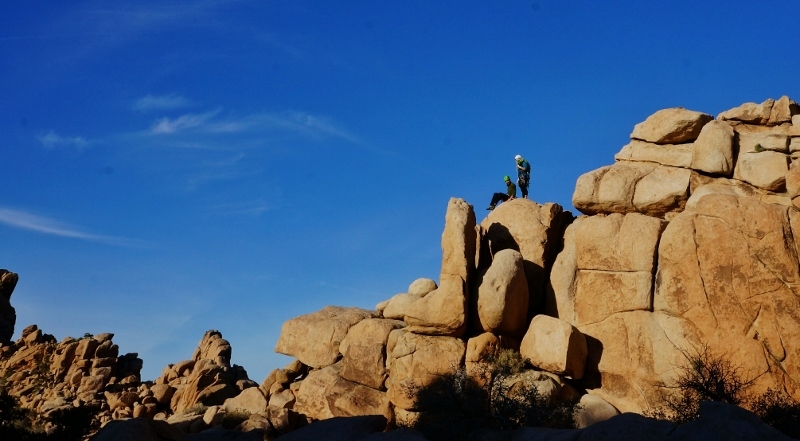 They had all the climbing gear and some were tackling very challenging climbs. 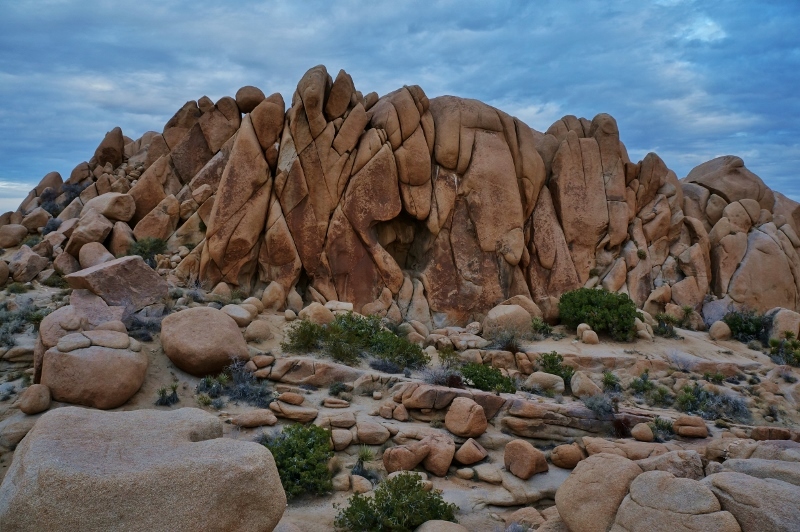 Seeing their tiny forms on the rocks really gives you an impression how truly massive some of the granite boulders are. After I finished up the loop and was back at the Hidden Valley entrance the sun was setting and I took these two photos. 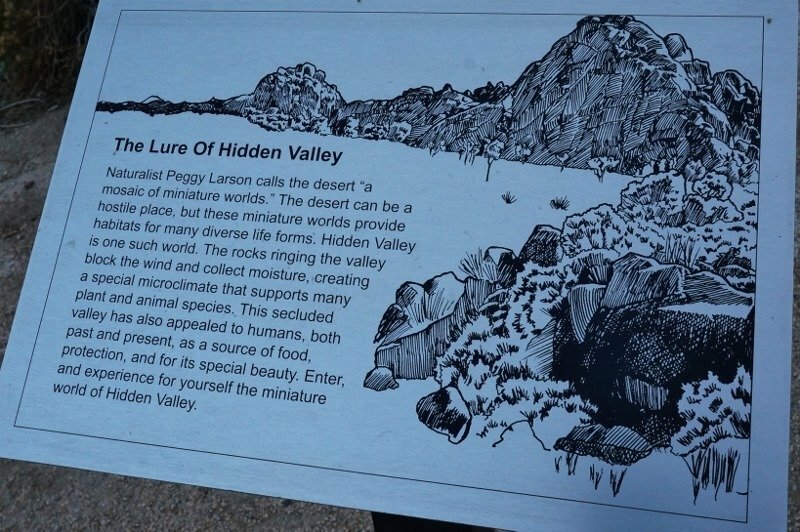 One is showing the Hidden Valley landscape and the second showing the view emerging from the valley. 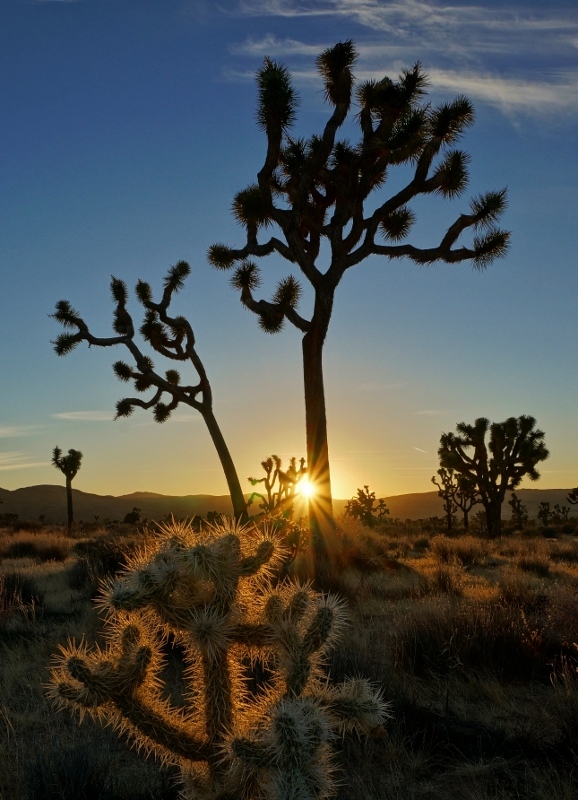 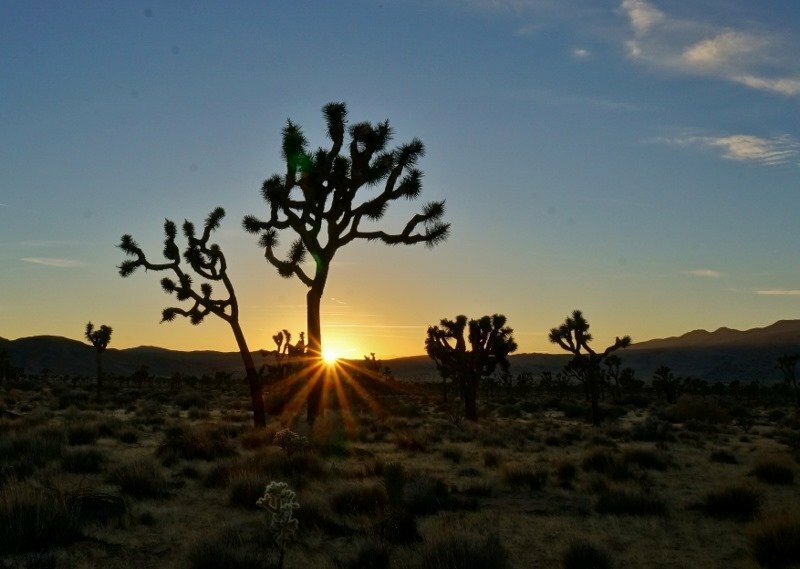 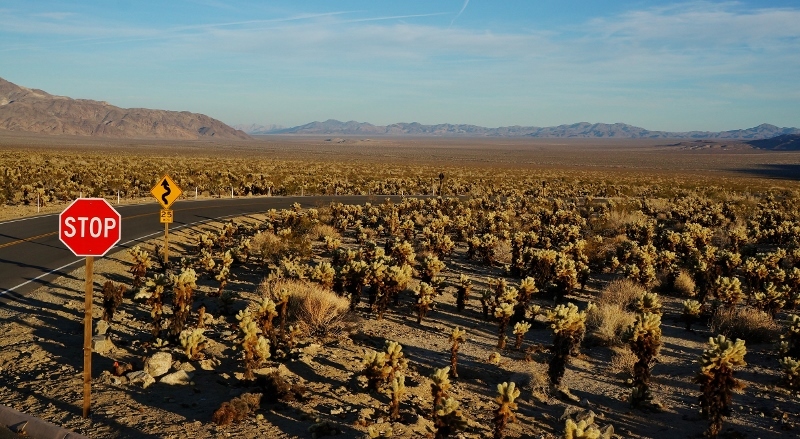 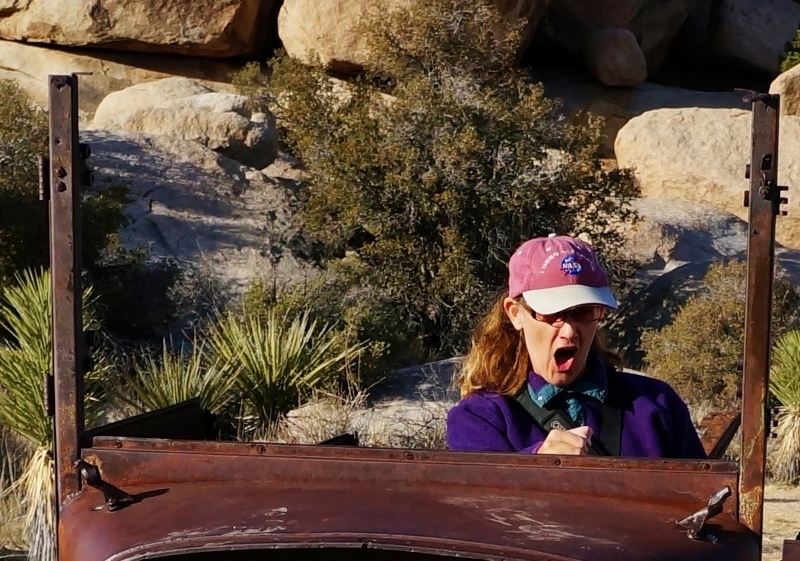 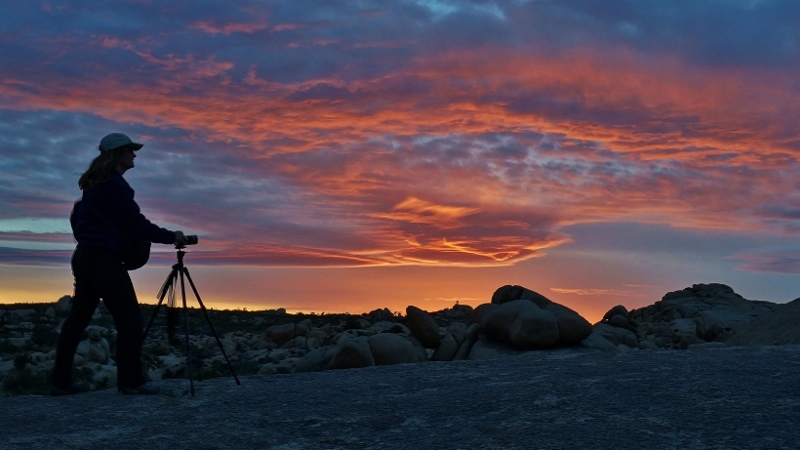 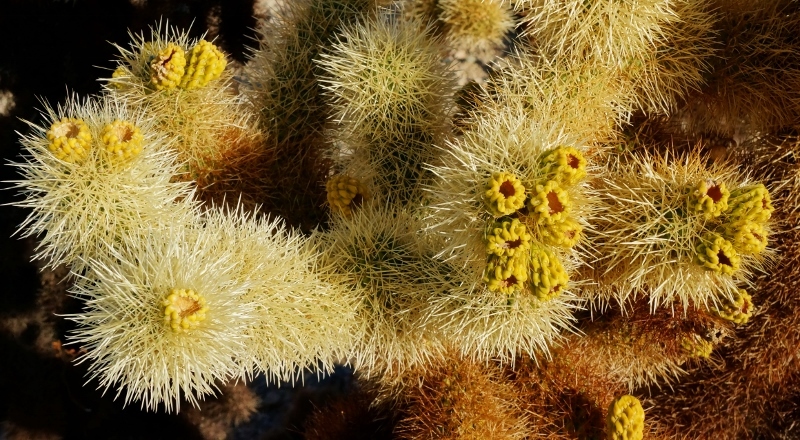 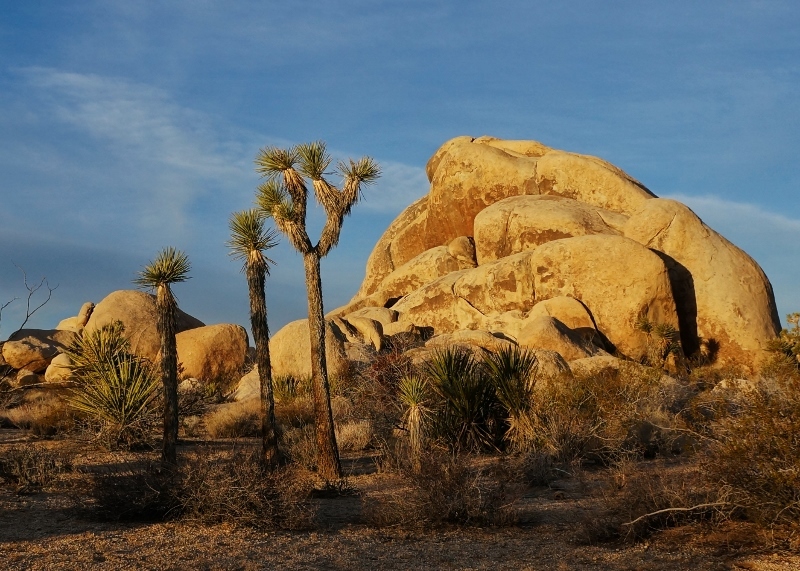 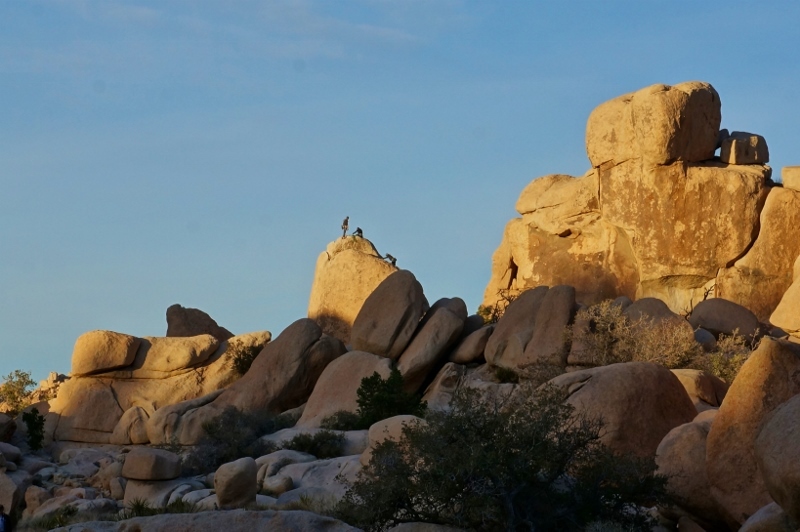 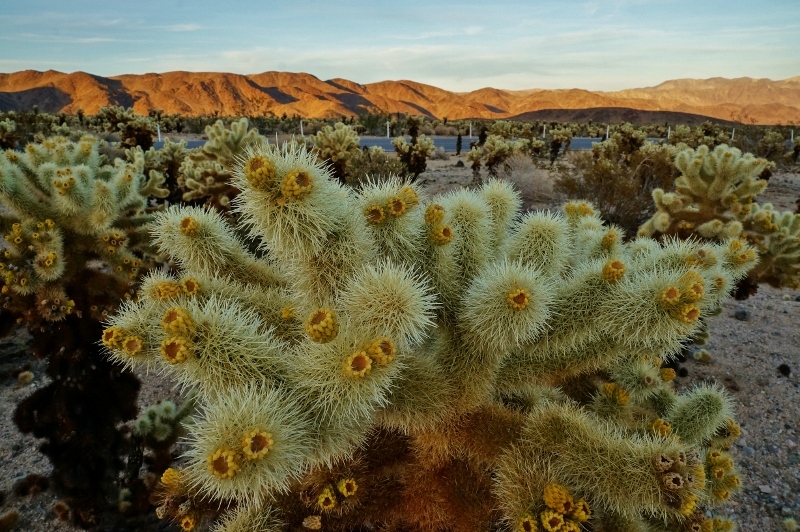 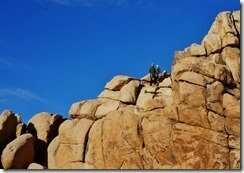 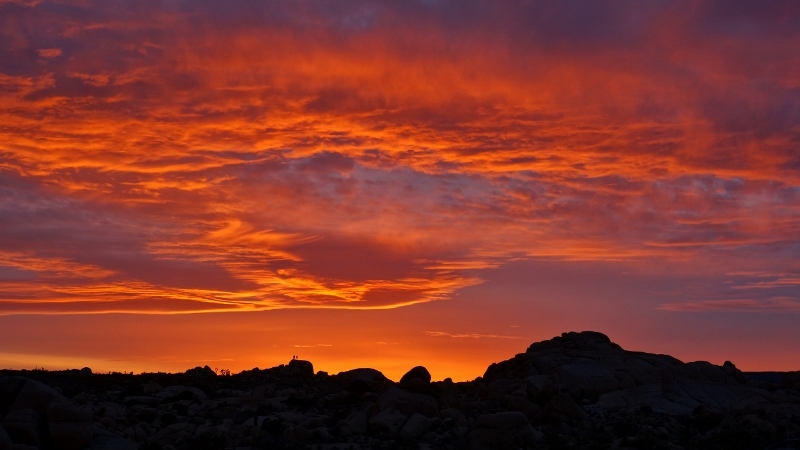 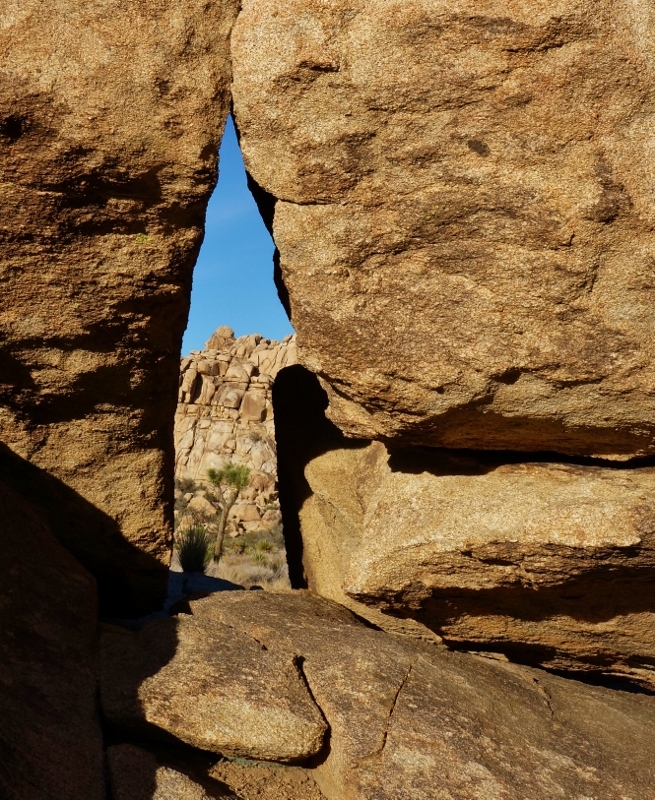 Amazing, what a special place Joshua Tree NP is. 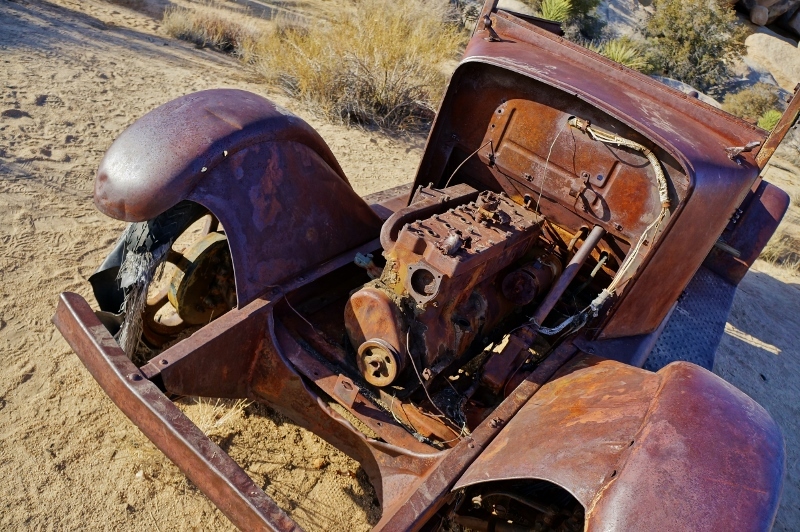 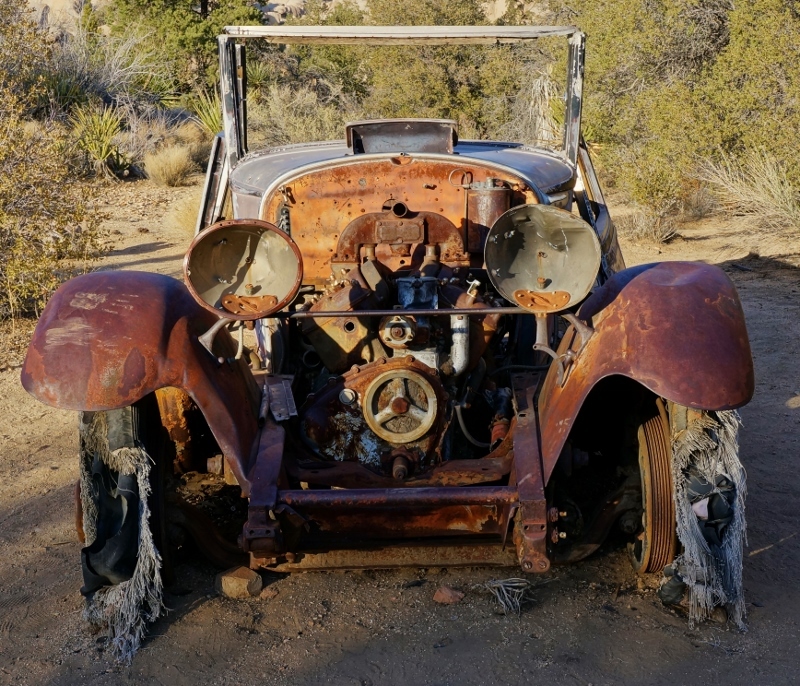 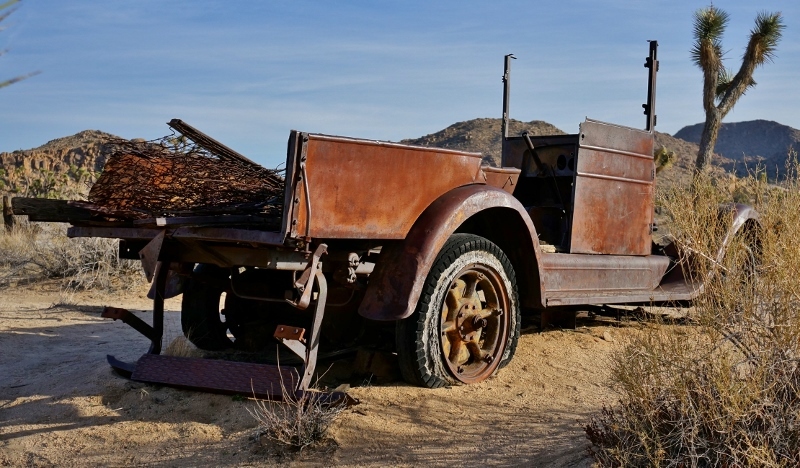 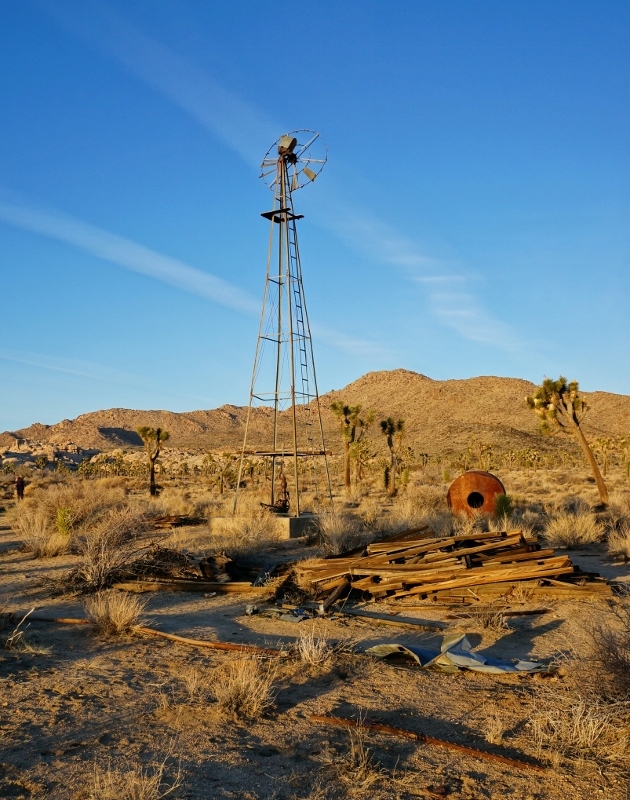 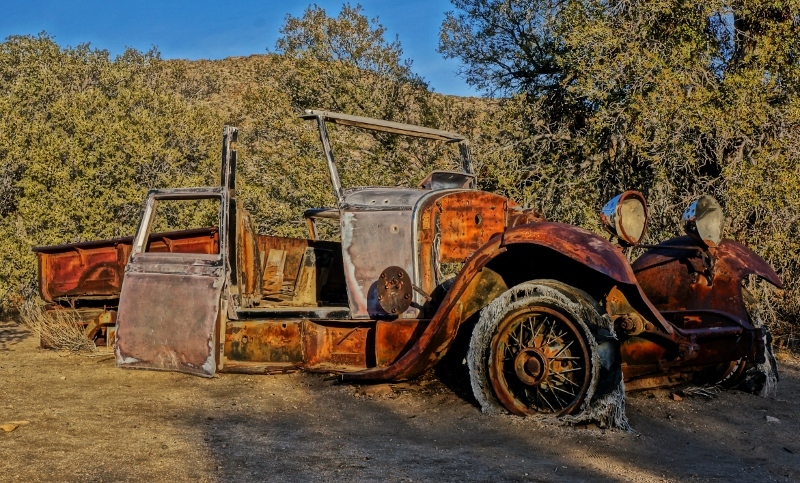 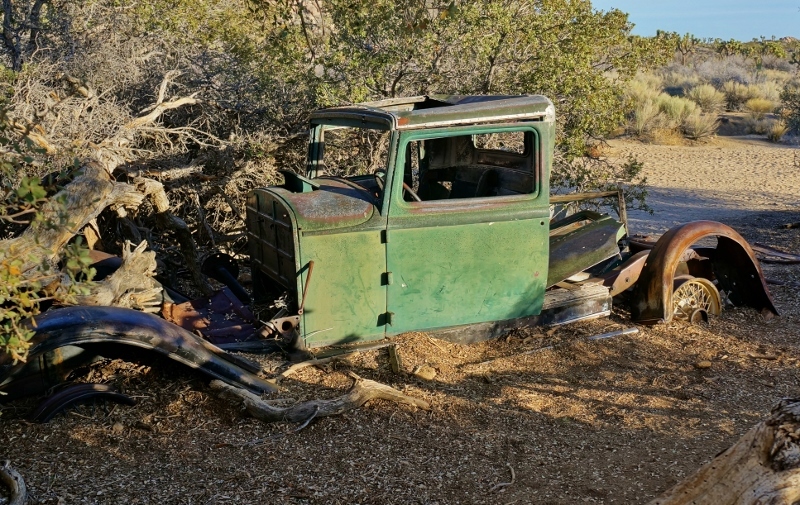 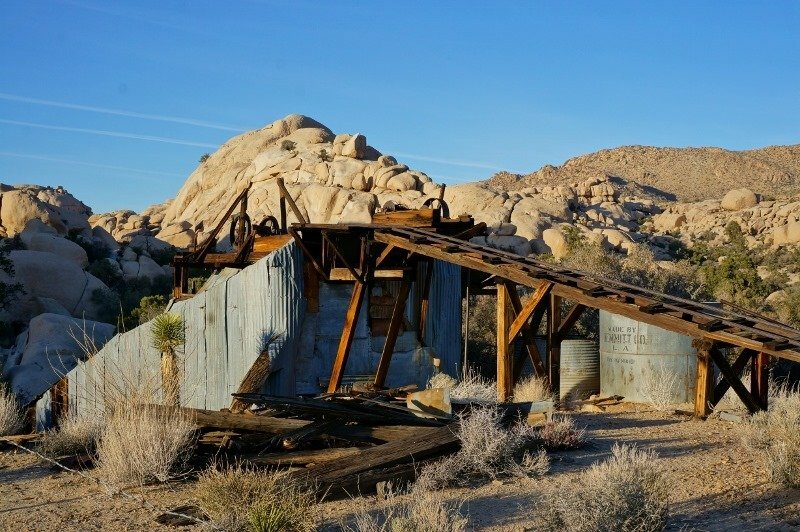 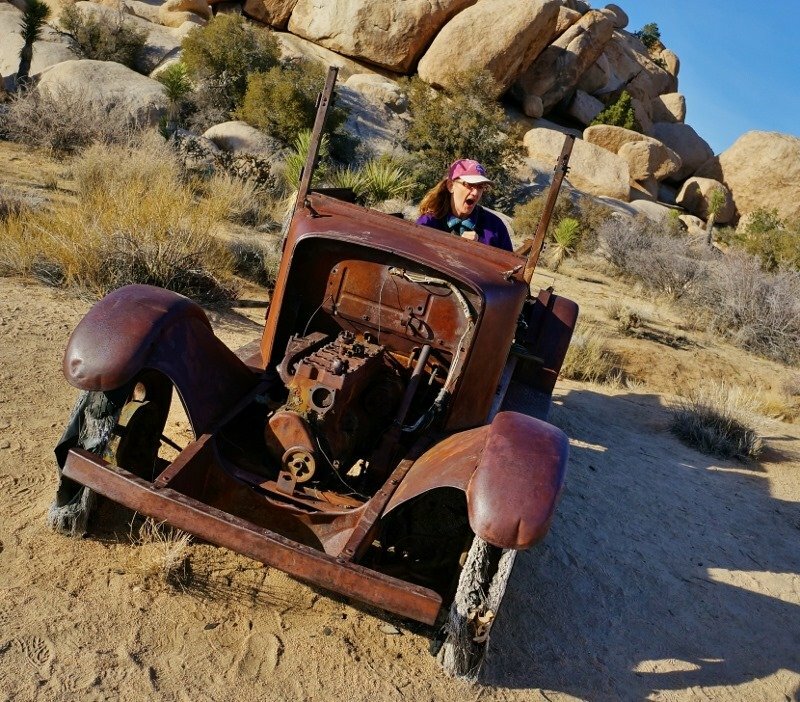 This second hike, although beautiful too, was more about the history of the place and discovering some neat old remnants left to rot in the desert. 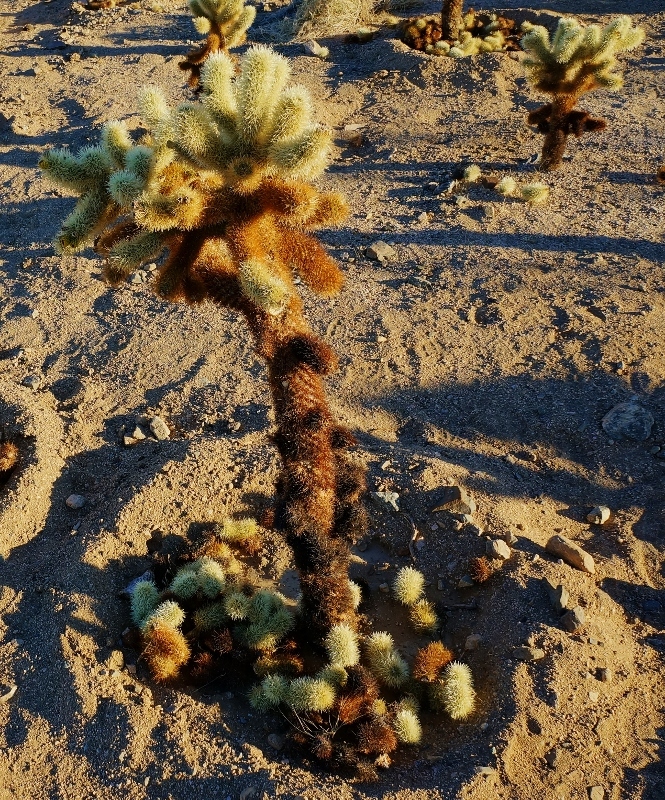 There is something really cool about the way the desert weathers things. 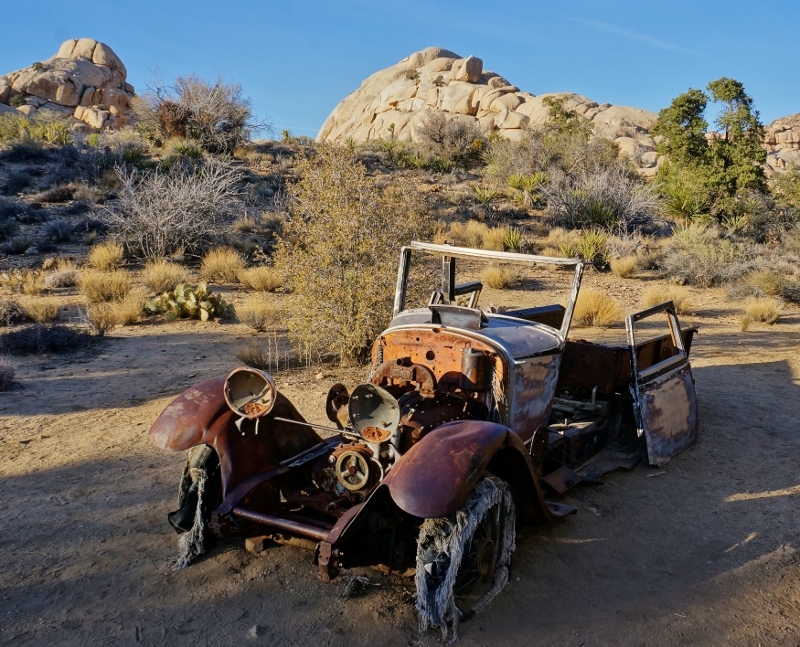 Along this flat easy trail are several old jalopies from the Bonny and Clyde era. 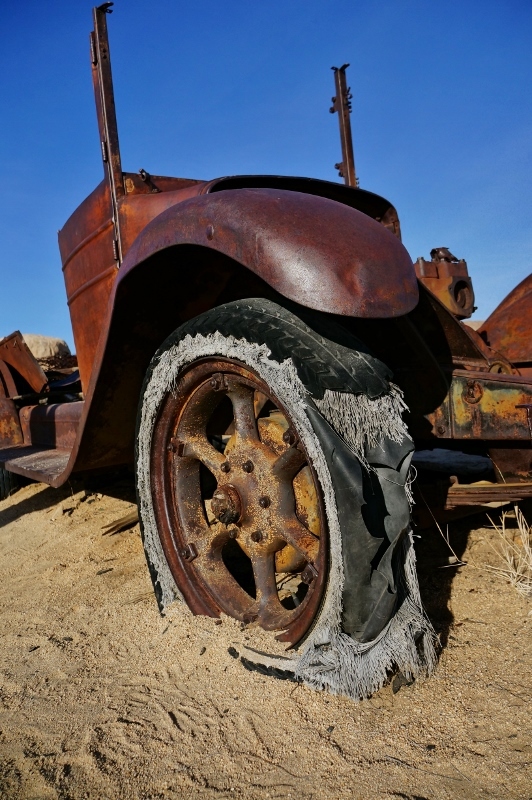 The surprising thing was the rubber on the wheels was still there. 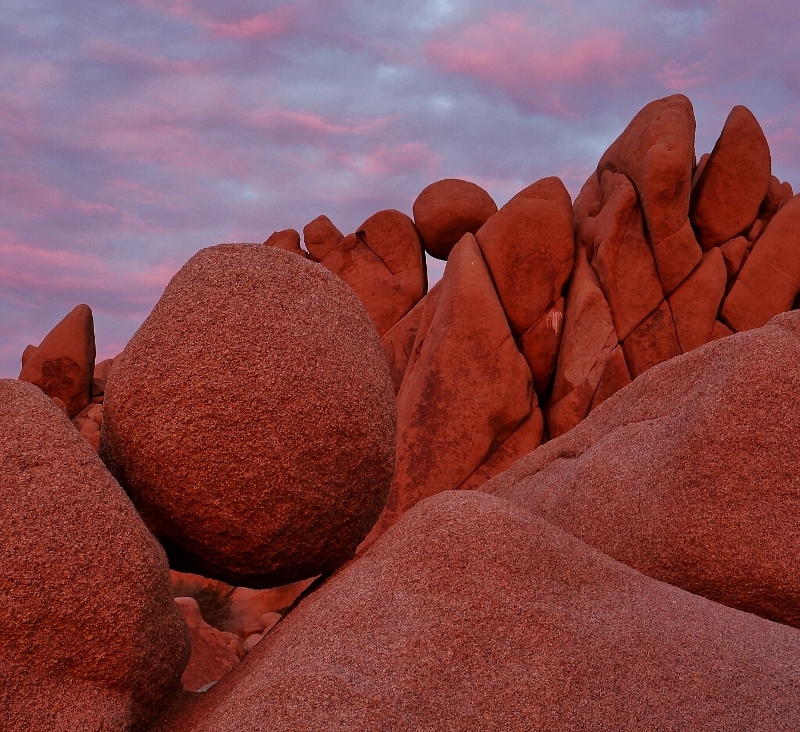 These made for some really neat and fun photographs. 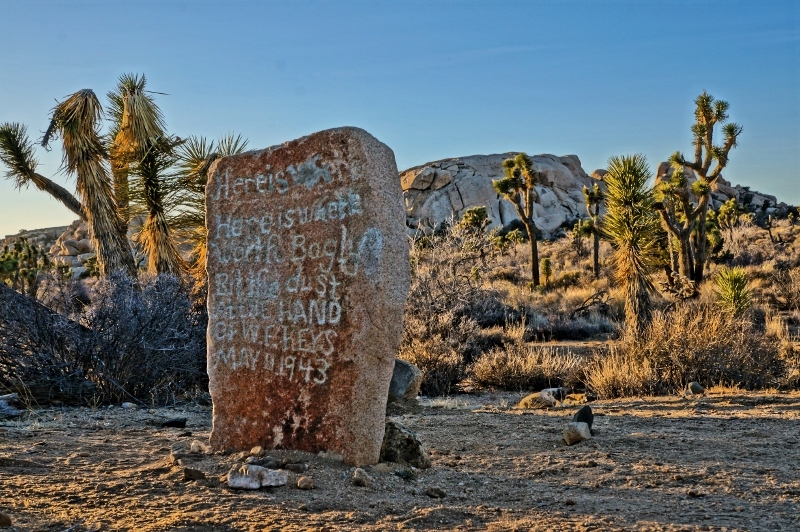 Along the hike we saw other remnants of the history, like a windmill, building foundations, and a large stone marking an historic shooting with the inscription “Here is where Worth Bagley bit the dust at the hand of W. F. Keys, May 11, 1943.” At the end of the trail is the mill itself and it’s mostly intact and in pretty good shape. 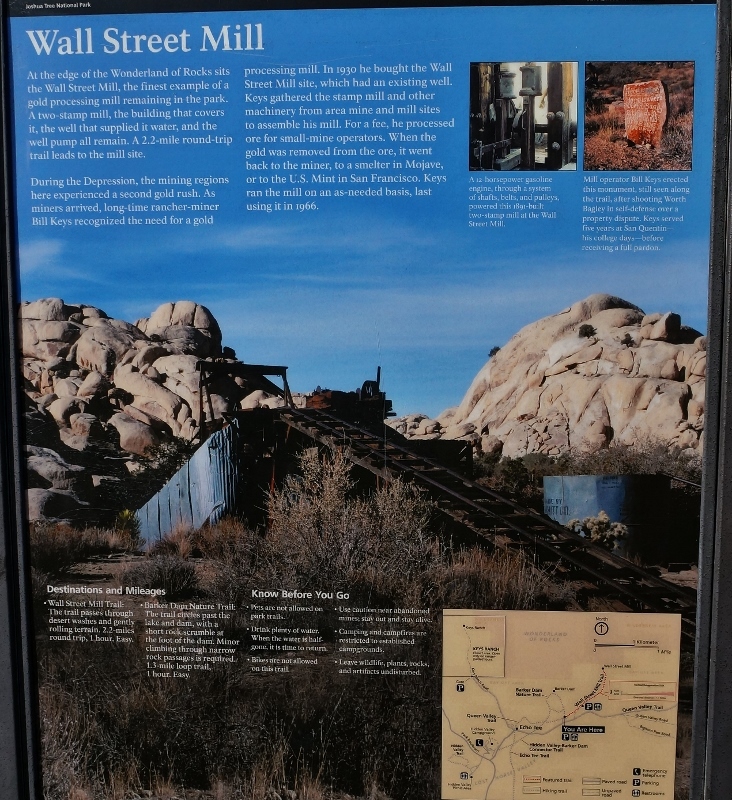 It was used to crush ore for mining gold. 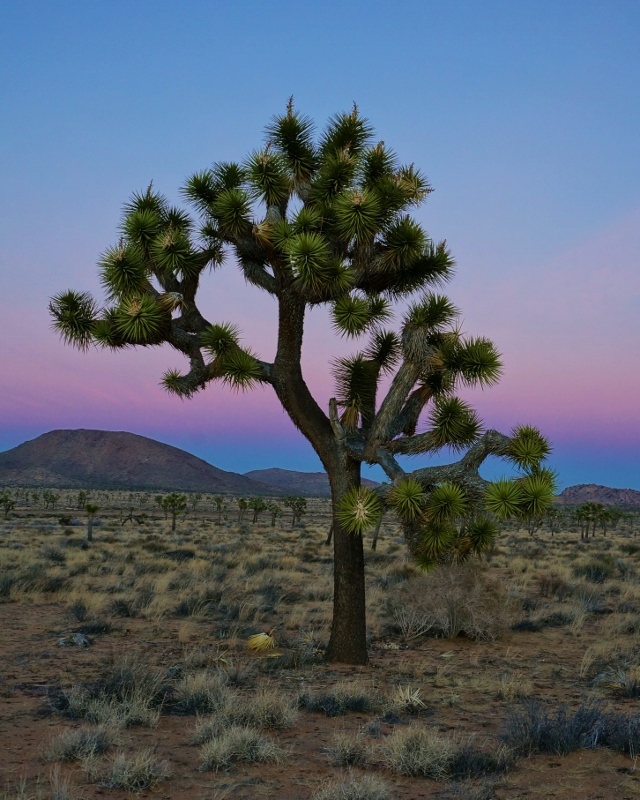 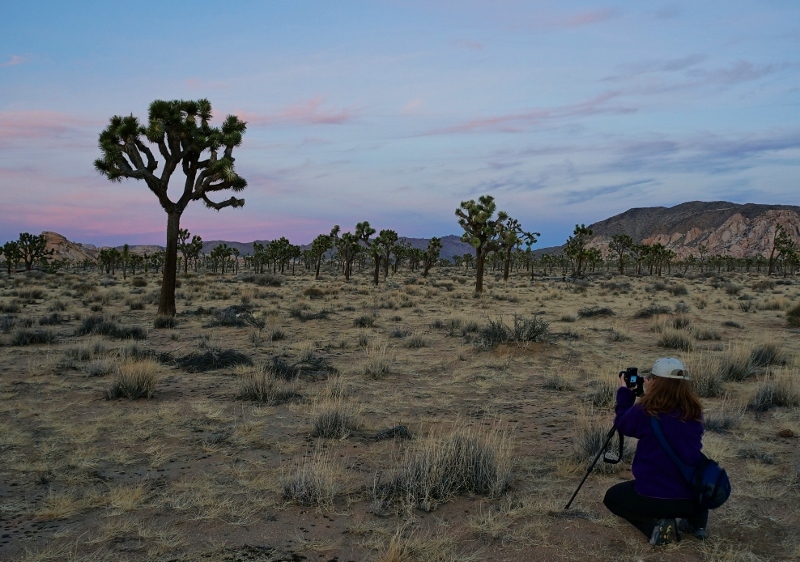 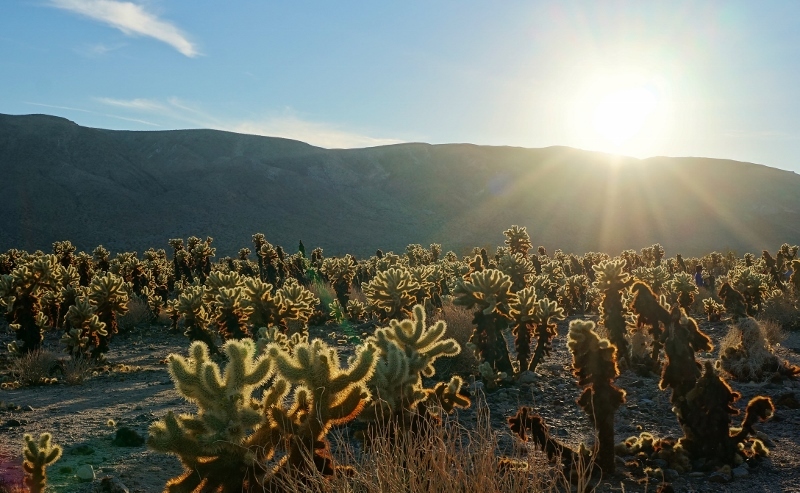 After each of our hikes we found a spot in the park to wander out and enjoy the sunset and dusk light among the Joshua Trees. 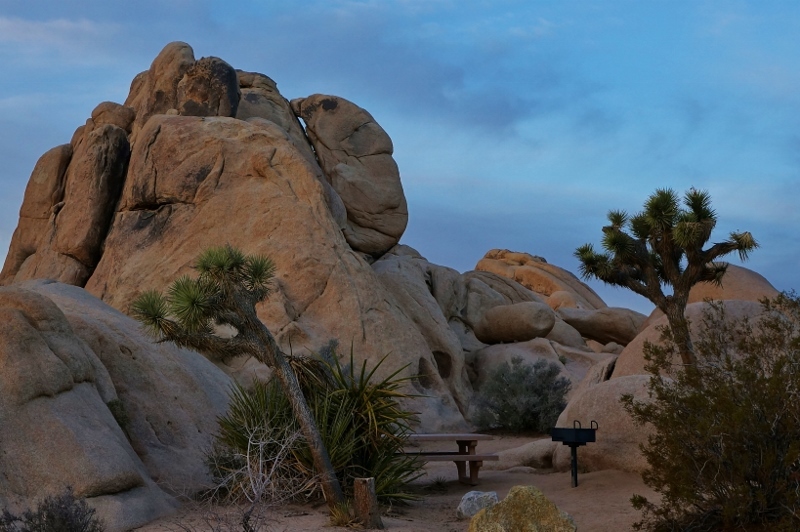 I find this to be the most beautiful time in the park as the light gets soft and warm, the wind dies down and everything is quiet. 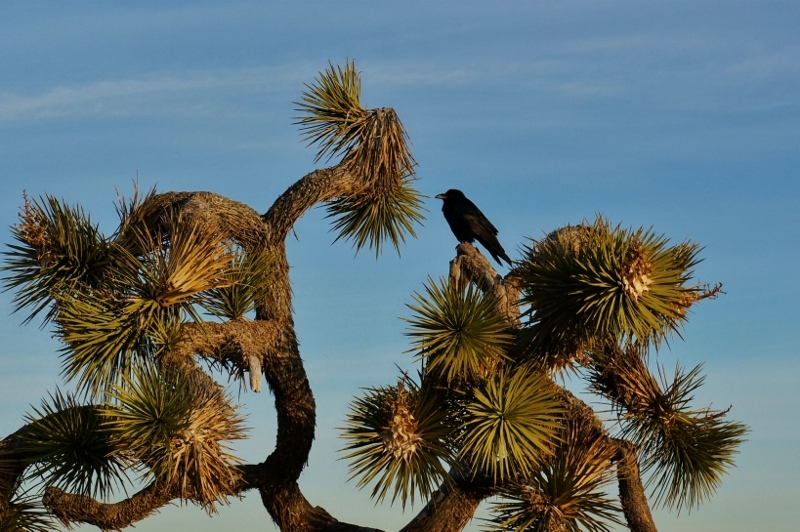 This is also when the animals start to appear, Jack rabbits, mice, birds and coyotes howling in the distance. 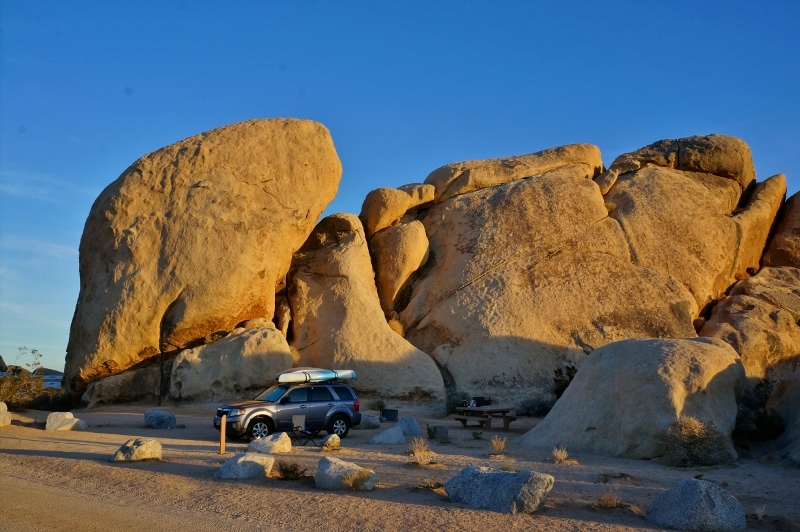 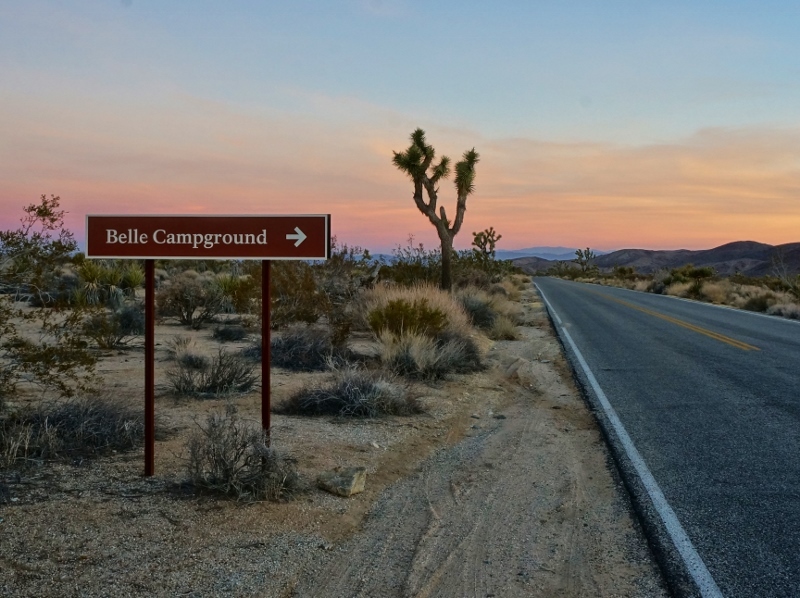 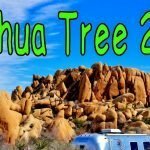 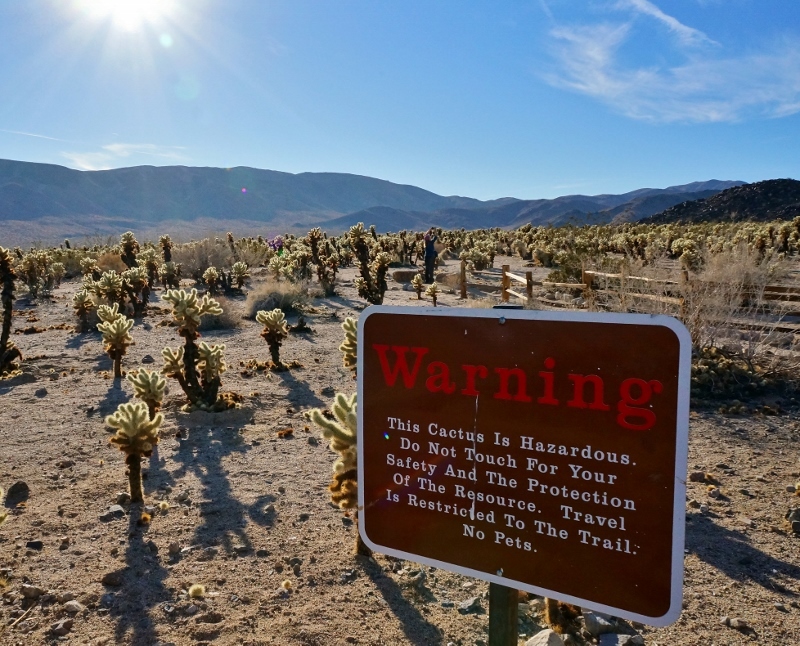 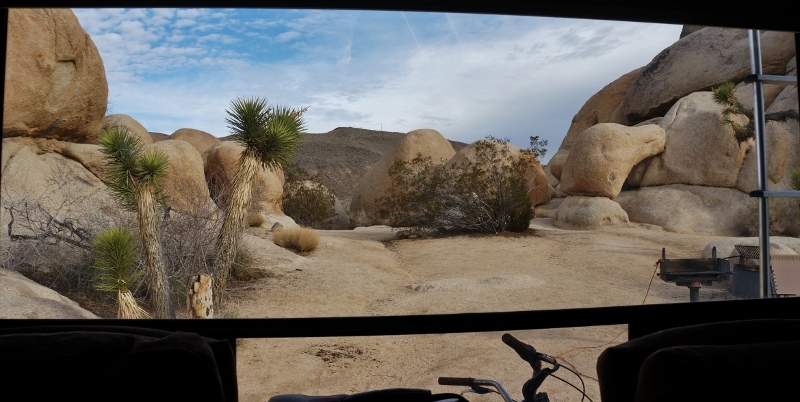 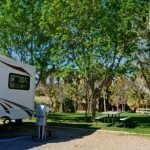 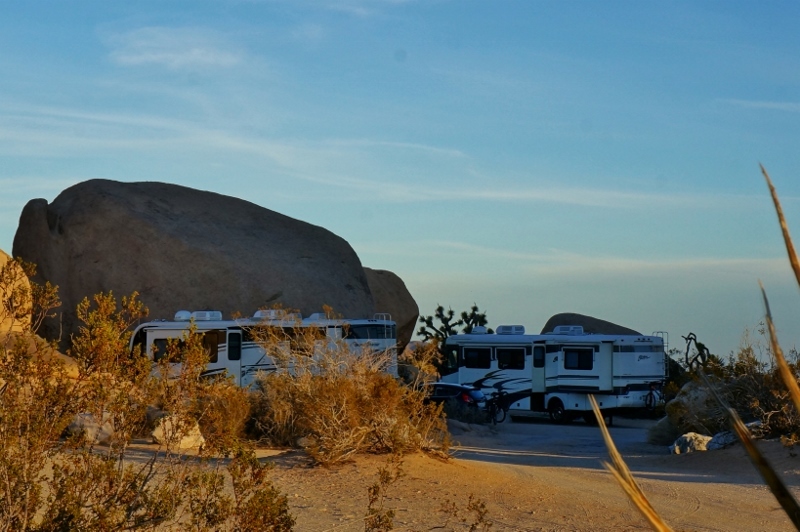 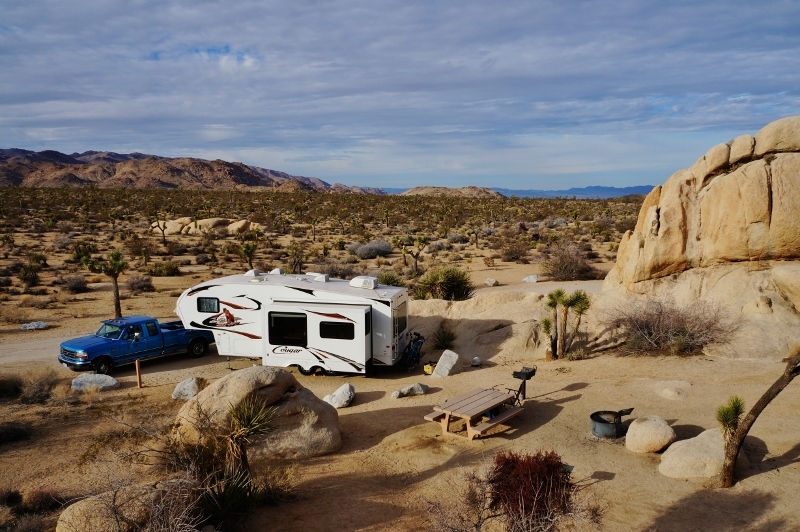 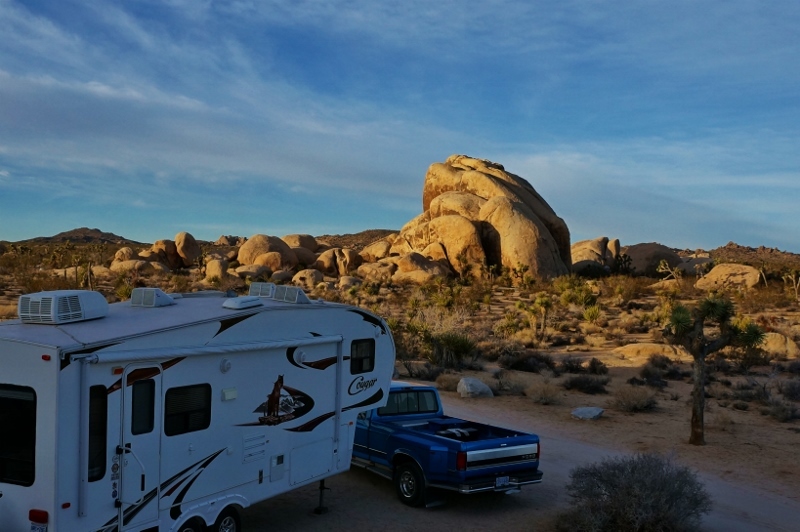 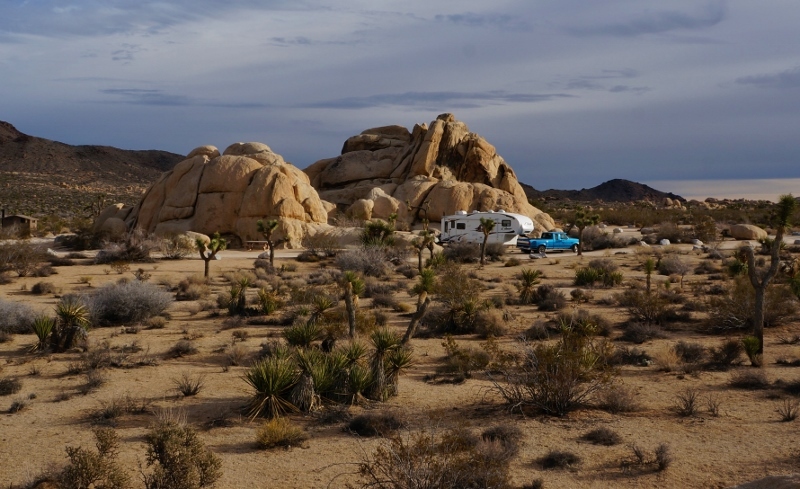 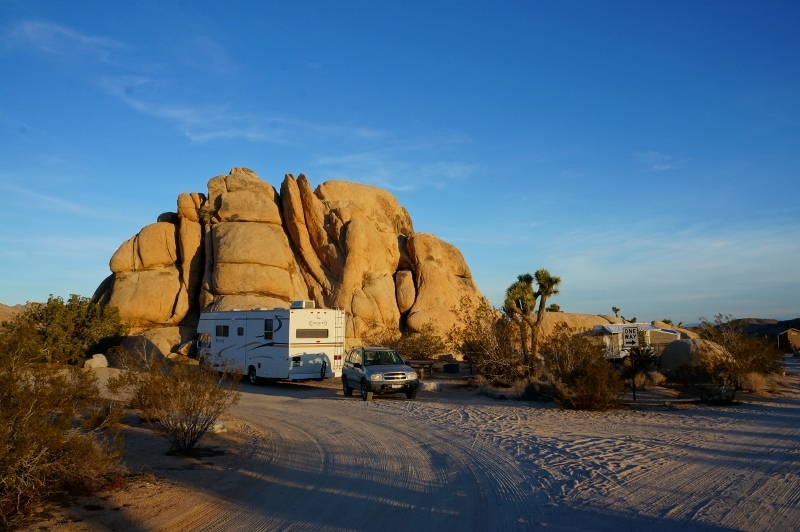 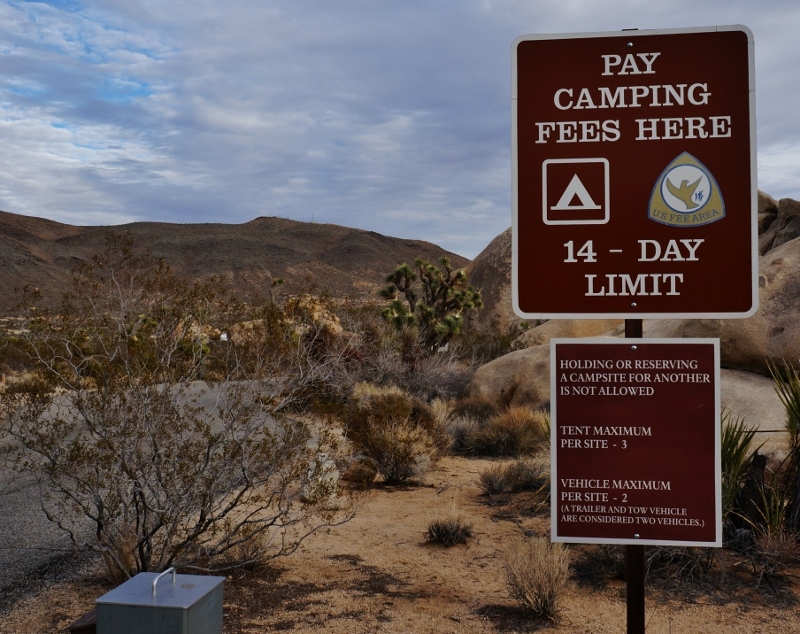 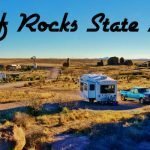 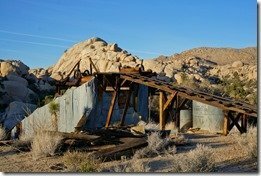 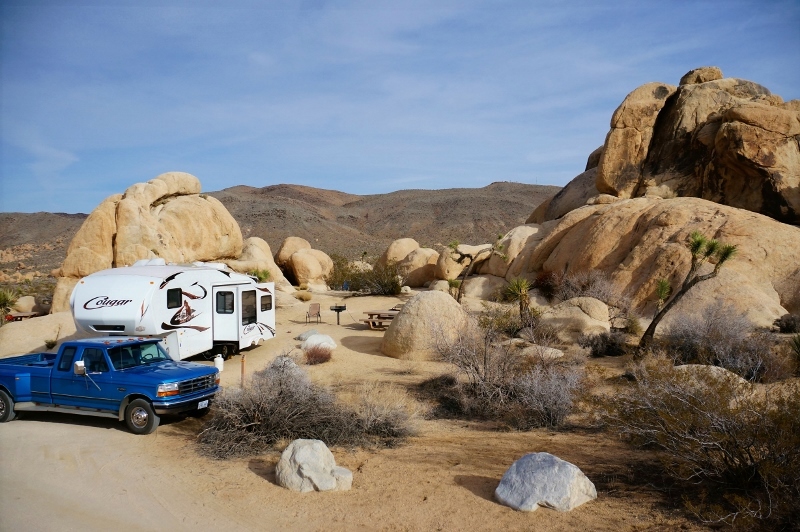 We had another amazing time during this visit to Joshua Tree National Park and were sad to leave but our RVing journey continues with more great adventures ahead. 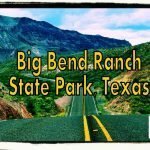 Want to follow along? 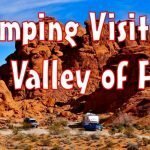 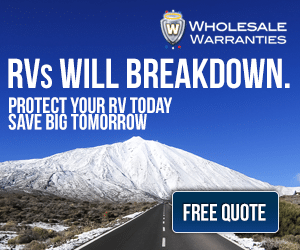 Sign up for the monthly newsletter or check out my activity feed on my Love Your RV Forum website.